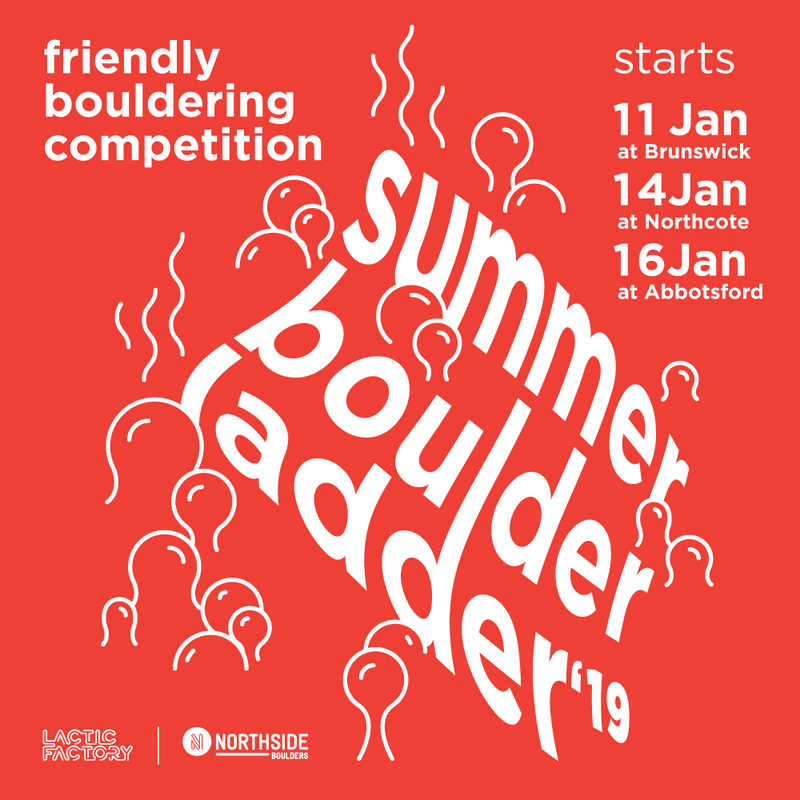 SUMMER BOULDER LADDER '19 | The friendly bouldering competition is back. It's gonna be bigger, hotter and friendlier. There will be 10 NEW PROBLEMS across all of our three gyms. To enter, write your full name down 	on the score sheet at any gym; make sure it's legible. If you want to try the problems at all three gyms, write your name down on the score sheet at 	all gyms. There will be 10 competition problems each week at three gyms. Tick the problems of the week off the scoresheet next to your name as you do them; the week's competition problems must be ticked off on their specific week, they cannot be ticked off once the week is up. Your score for each week will be the number of problems you tick at NORTHCOTE or BRUNSWICK or ABBOTSFORD (whichever is higher). Your final score will be your top four weeks from either gym plus your	score at the final. To win prizes (except most improved), you must compete	in the final. Problems at BRUNSWICK gym will be set on Friday morning & can be ticked off until the end of the following Thursday. Problems at NORTHCOTE gym will be set on Monday morning & can 	be ticked off until the end of the 	following Sunday. Problems at ABBOTSFORD gym (The Lactic Factory) will be set on Wednesday morning & can be ticked off until the end of the following Tuesday. To enter, write your team name down on the score sheet next to your name. A team must have four members. Your team’s total score is the sum of all four individual team members’ score, and your team’s score in the team events at the final.